Michael Shackleford, a who has made a career of analyzing casino games, designed Australian Reels Slot Machine in 2009. 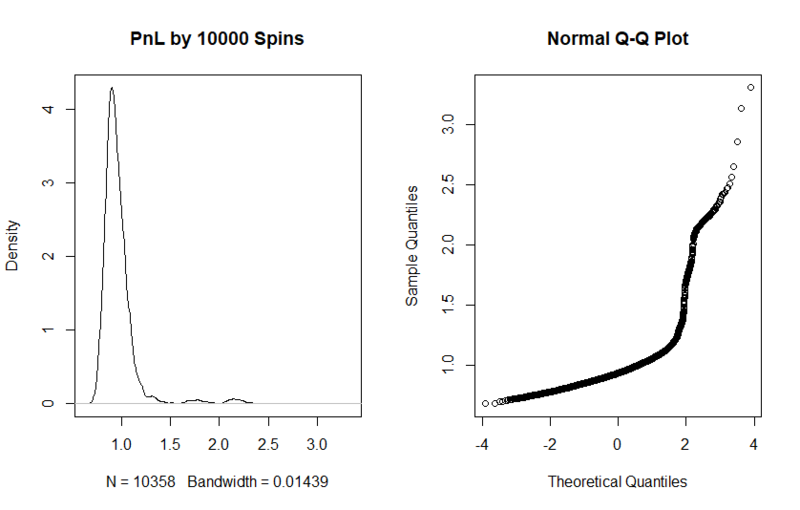 In modeling the casino&apos;s risk of ruin he (blindly) relied on the normal distribution. We show that this drastically undervalues the tail risk. Although letYourMoneyGrow.com is the website for those, who play only games with a positive expectation, we are sure that this essay will be interesting for our readers. And not only from educational point of view; finally, there is a way to make money in casino: namely to be a casino&apos;s owner. An casino owner does have a positive expectation of the game. However, it is not enough: additionally, s/he has also to control the risk, which might be high. The next three tables show the probability that the return of the game will fall between the specified markers and number of spins. For example, with one million spins there is a 95% chance that the return of the game will fall between 95.21% and 102.70%. It is beyond the scope of this document to explain how these were calculated, but any introductory statistics text will explain it under "confidence intervals". From the quoted text one can infer that Mr. Shackleford relies on the normal distribution. This also can be formally checked, if you calculate the mean and variance of the game outcomes, input them as the Gaussian distribution parameters and calculate the 95% confidence interval. But relying on the normal distribution is a big negligence! Look at Return Table: some combinations come though extremely rarely, their payoff is huge. And a casino has to offer such combinations, because gamblers subconsciously want to make a jackpot; smaller wins are much less exciting even if their probabilities are higher. But extreme payoffs mean that one can (and should) expect heavy tails! 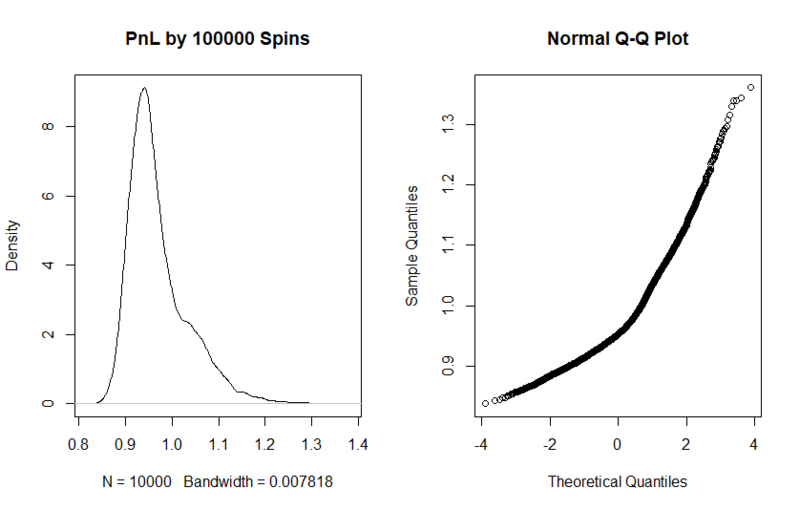 Starting from one million spins the law of the large numbers does it job and cuts the tails, thus the normal approximation works well (although still not perfectly, as you can readily see from the highest and lowest quantiles in QQplot). 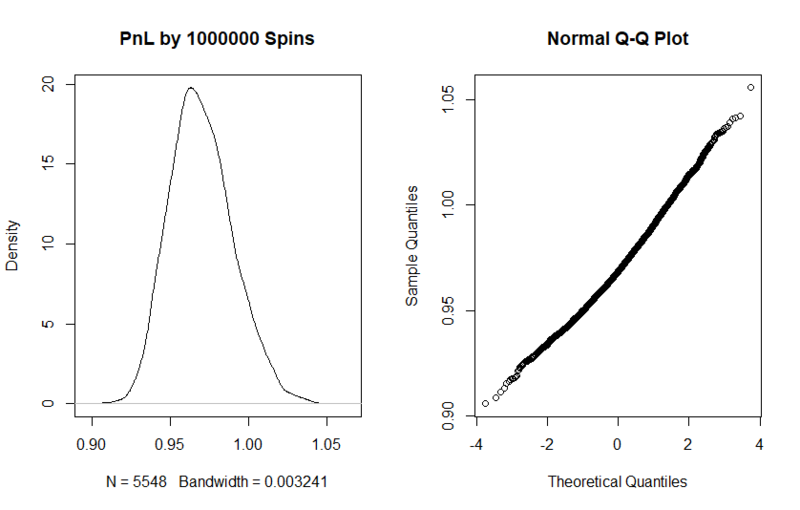 But already by 100 thousands spins the normal distribution works poorly. And by 10000 rounds (which is realistic for a small casino) the tail risks are extremely high! The probability to make a loss, i.e. to have to pay more money than was encashed from gambles is above 10%! And in 1% of scenarios a casino has to pay more than double of what it has raked! And of course there are rent costs, taxes and so on! Thus a gambling business is not always a gold mine! Furthermore, if planned carelessly, it might go bankrupt! So what is the moral of this essay? Is it relevant for casino owners only? No, it is relevant for everyone, who engages mathematical modeling (esp. in trading): Do check your assumptions by means of the Monte-Carlo simulation, it is easy, cheap and straightforward! By this essay we did not mean to ridicule Michael Shackleford. Rather, it is the case like When Genius Failed. Since we are not the owner of the implementation of Australian Reels Slot Machine, we cannot publish the complete program code here for the sake of reproducibility, as we usually do. However, to give you a better idea of what data we have plotted above, we provide the code that we used to validate this Machine. 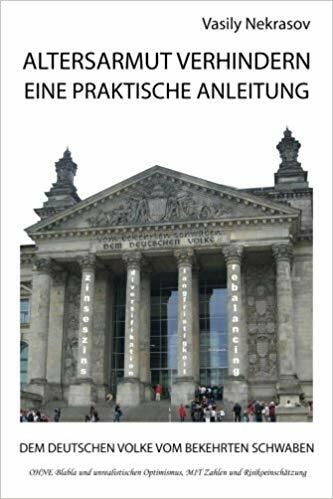 Next Next post: Betriebstrenten sind in Gefahr – Teil II: was tun?